Alpacas are interesting animals. They are small, hardy and easy to keep in a commercial farm. We are going to talk about five very unusual facts about alpacas that most people haven’t heard of. Anyone who has been around alpacas, probably already knows that alpacas resemble closely a miniature form of camel or llama. They are small, cute, and friendly. 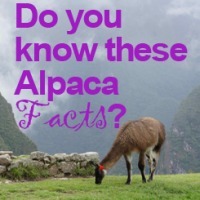 But there are many other facts about alpacas that you may not be familiar with. For example, alpacas are profitable commercial farm animals that are members of the Camelidae family. Below are more fun facts about alpacas. Alpacas are exotic animals. They are native to the South American continent, and they usually graze in herds on the level height grasses of the Andes of southern Peru, northern Bolivia, Ecuador, and northern Chile at an altitude of 16,000 ft. above the sea level. Many of you know that alpaca grow fleece. But what you may not know is the wool from alpaca fleece is actually better than the sheep wool. It’s warmer, long lasting, water resistant, flame resistant, and does not have the itching effect like lamb wool. Alpaca fiber comes in 16 tones that are recognized by the textile industry, from white to light rose gray to dark fawn, in addition to the blends that can be made from those, thus minimizing the need for pollution-intensive dying. There are two types of alpacas, the Huacaya and the Suri. Huacaya alpacas are fluffy with teddy bear like fibers on them and because of their cuddly looks they have a more universal appeal. They are also hardy animals so they are a bit easier to keep and raise on a farm. Suri alpacas have long shiny locks with very soft curly hair. They are much more expensive and rare. Fiber from suri alpacas sells for a higher price. 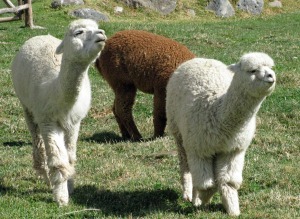 Alpacas make some kind of humming noise which is similar to musical purring. Alpacas hum when they are curious, content, worried, bored, fearful, distressed or cautious. During mating they make a kind of orgle sound. Alpaca farming is easy and fun. It could also be a significant source of income through various alpaca products, and most of all, alpacas are very easy to keep and raise. They are clean, economic, and with a high return on investment. P.S: – Want to learn more? Click here to book a meeting with us. We would love to hear from you, so please put down a few words in the comment box below. We would also appreciate your comments and likes, so please visit our Facebook page.